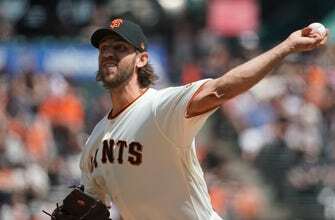 SAN FRANCISCO (AP) — Madison Bumgarner pitched into the eighth inning to give a weary bullpen much needed rest and the San Francisco Giants beat Colorado 5-2 Saturday, handing the Rockies their eighth straight loss. Bumgarner (1-2) allowed two runs on six hits. The big lefty struck out seven, walked one and didn’t allow a runner past first base until the sixth when Garrett Hampson doubled in Charlie Blackmon. Bumgarner left after Chris Iannetta’s leadoff double in the eighth, angrily slapping his glove on his thigh as manager Bruce Bochy came out to replace him. That was big for San Francisco’s bullpen after eight relievers combined for 14 scoreless innings in Friday’s marathon.